You will be greeted by our friendly, professional Mint wash associates who will guide you through the simple process. Basically, all you need to do is put your vehicle in neutral when asked, and relax! We’ll do the rest. We clean the vehicle exterior with gentle touch washers and mild cleaning solutions. Your wheels and whitewalls tires will be cleaned, and your vehicle will be rinsed and gently dried with our exclusive hot air drying system – all automatically, in five minutes or less! Yes. For safety reasons, there must be a driver at the wheel. All Mint Smartwashes use extensive lighting and lots of glass, to create a comfortable, wide-open environment. We’ll give you easy to follow instructions, answer any questions you might have, and guide you through the process. 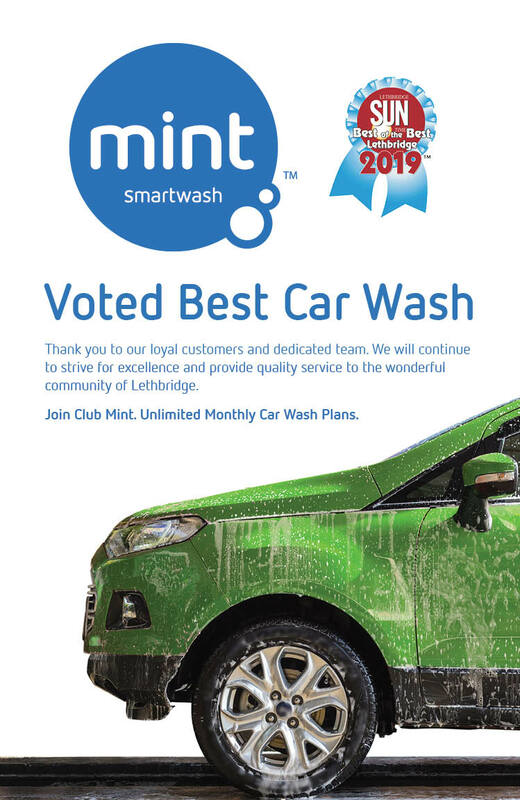 Mint Smartwashes offers “exterior-only” service. We do provide self-service, super-powered 120 hp vacuums at all our locations. All locations have extra equipment for state-of-the-art machine-fed mat cleaning. And all at not extra charge! We’re always on the lookout for good people to join our team! Contact us to inquire about job opportunities, or stop by and visit us at 1903 – 3 Avenue S. Lethbridge, AB – one block west of the water tower.